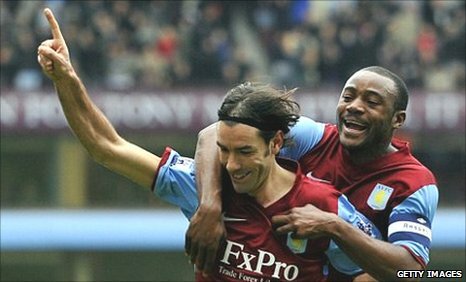 Robert Pires scored his first goal for Aston Villa as they saw off Blackburn to reach the fifth round of the FA Cup. Ciaran Clark nodded Villa ahead but Rovers were quickly level as Nikola Kalinic bundled home from close range. Veteran winger Pires restored Villa's lead with a sweet half-volley before Nathan Delfouneso's header made it 3-1. Martin Olsson fired against the bar for Rovers but, even after Villa had Nathan Baker sent off for a wild tackle, Blackburn rarely threatened a comeback. The home side's victory continues their recent revival, despite their manager Gerard Houllier fulfilling a pre-match pledge to rotate his squad, and maintains their recent dominance over Rovers in cup competitions. As well as knocking the Ewood Park side out of the Carling Cup earlier this season, Villa also came out on top in the third round of the FA Cup in 2010 on their way to the semi-finals. Houllier's men began this tie strongly too, and got their reward for a strong start when Clark made the most of some poor Blackburn defending to head home at the back post. Rovers had seen Roque Santa Cruz depart with a suspected hamstring injury shortly before the Villa opener but his replacement, Croatia striker Kalinic, did not take long to make an impact on the game. Michel Salgado stormed down the right flank and Kalinic got enough on his cut-back to force the ball over the line despite the best efforts of Villa goalkeeper Brad Friedel. Villa remained on top, however, and regained control of the game thanks to two goals in quick succession before half-time from Pires and Delfouneso. Pires, a three-time Cup winner with Arsenal who scored the Gunners' winner against Southampton in the 2003 final, has been a largely peripheral figure at Villa Park since joining in November - but the 37-year-old rolled back the years with a fine finish from Delfouneso's knockdown. Rovers briefly rallied and Pires had to hack a Kalinic shot off the line while Friedel pushed a Chris Samba header round his post. But Delfouneso did not have to wait long to get on the scoresheet himself, meeting a precise Baker cross with a firm header that Rovers keeper Paul Robinson could not keep out. Houllier's side maintained their dominance after the break and Baker almost added a fourth goal when he headed narrowly wide from another Bannan corner, while Kyle Walker and Delfouneso also went close. With half an hour left, Blackburn were given renewed hope when Baker was shown a straight red card for a two-footed lunge at David Hoilett. Hoilett fired over as Rovers tried to make the most of their numerical advantage but, in truth, the home side remained well on top. It was Villa who created the best late chances and only two fine saves by Robinson stopped substitute Stewart Downing from adding to their tally before the end. 90:00+1:48 Corner from the left by-line taken by Morten Gamst Pedersen, Carlos Cuellar makes a clearance. 90:00+1:34 Morten Gamst Pedersen delivers the ball, Grant Hanley takes a shot. Ciaran Clark gets a block in. 90:00+1:24 Short corner taken by Morten Gamst Pedersen. 87:41 Free kick awarded for an unfair challenge on Emile Heskey by Christopher Samba. Direct free kick taken by James Collins. 85:29 Effort on goal by Benjani Mwaruwari from inside the penalty box misses to the right of the target. 84:31 Unfair challenge on Grant Hanley by Emile Heskey results in a free kick. Paul Robinson restarts play with the free kick. 84:31 Substitution Benjani Mwaruwari on for Jason Roberts. 82:42 The ball is swung over by Stewart Downing. 82:12 Corner taken left-footed by Barry Bannan. 80:29 Stewart Downing takes a shot. Nigel Reo-Coker takes a shot. Grant Hanley gets a block in. Christopher Samba gets a block in. Corner from right by-line taken by Barry Bannan. 80:16 Shot by Stewart Downing. Save made by Paul Robinson. 79:52 Foul by Kyle Walker on David Hoilett, free kick awarded. Morten Gamst Pedersen takes the free kick. 76:17 The assistant referee signals for offside against Martin Olsson. Brad Friedel restarts play with the free kick. 75:03 Free kick awarded for a foul by Jason Roberts on Nigel Reo-Coker. Free kick taken by Brad Friedel. 74:45 Shot by Stewart Downing from 12 yards. Save by Paul Robinson. 74:19 Christopher Samba challenges Nigel Reo-Coker unfairly and gives away a free kick. James Collins takes the direct free kick. 72:50 Marc Albrighton gives away a free kick for an unfair challenge on Grant Hanley. Grant Hanley takes the direct free kick. Correction - 71:02 Effort on goal by David Hoilett from just inside the penalty area goes over the target. Correction - 71:02 Substitution Nathan Delfouneso leaves the field to be replaced by Marc Albrighton. 71:02 Shot on goal by David Hoilett from just inside the area clears the crossbar. 71:02 Substitution Marc Albrighton comes on in place of Nathan Delfouneso. 70:21 The ball is crossed by Jason Roberts. 69:36 Substitution Vincenzo Grella replaces Keith Andrews. 69:18 The ball is sent over by Martin Olsson. 68:41 Martin Olsson delivers the ball, Stewart Downing manages to make a clearance. 67:10 Substitution Robert Pires leaves the field to be replaced by James Collins. 66:51 A cross is delivered by David Hoilett. 65:54 Stewart Downing delivers the ball, Grant Hanley makes a clearance. 64:00 David Hoilett sends in a cross. 63:30 Unfair challenge on Emile Heskey by Jason Roberts results in a free kick. Ciaran Clark takes the free kick. 61:50 Free kick awarded for a foul by Nathan Baker on David Hoilett. Paul Robinson takes the free kick. 61:50 Sent off Nathan Baker is sent off by the referee for serious foul play. 60:04 Keith Andrews has a headed effort at goal from close in which goes wide right of the target. 59:40 David Hoilett fouled by Nigel Reo-Coker, the ref awards a free kick. Keith Andrews takes the free kick. 57:22 The ball is crossed by Stewart Downing. 56:03 David Hoilett produces a cross. 53:28 Shot from 25 yards from Kyle Walker. Blocked by Grant Hanley. Inswinging corner taken left-footed by Barry Bannan from the right by-line, Effort from deep inside the area by Ciaran Clark misses to the right of the target. 49:01 Free kick awarded for an unfair challenge on Emile Heskey by Grant Hanley. Direct free kick taken by Robert Pires. 48:01 Corner taken right-footed by Robert Pires from the left by-line, Header from close in by Nathan Baker misses to the right of the target. 47:28 Corner taken right-footed by Robert Pires, clearance by Christopher Samba. 46:59 Inswinging corner taken by Barry Bannan, clearance by Christopher Samba. 46:19 A cross is delivered by Stewart Downing. 45:03 Substitution (Aston Villa) makes a substitution, with Stewart Downing coming on for Gabriel Agbonlahor. 45:00+2:35 The first half comes to an end. 44:43 Gabriel Agbonlahor produces a right-footed shot from just outside the penalty box that misses to the left of the goal. 43:17 Shot from 18 yards by Martin Olsson. 41:48 The assist for the goal came from Nathan Baker. 41:48 GOAL - Nathan Delfouneso:Aston Villa 3 - 1 Blackburn Nathan Delfouneso finds the net with a headed goal from close range. Aston Villa 3-1 Blackburn. 41:21 The ball is crossed by Martin Olsson, Nigel Reo-Coker makes a clearance. 39:20 Centre by Nathan Baker, Christopher Samba makes a clearance. 38:33 Inswinging corner taken by Morten Gamst Pedersen, Christopher Samba takes a shot. Save made by Brad Friedel. 37:57 Nikola Kalinic takes a shot. Robert Pires gets a block in. 37:30 Inswinging corner taken left-footed by Morten Gamst Pedersen from the right by-line. 37:23 The ball is sent over by Jason Roberts, Carlos Cuellar manages to make a clearance. Correction - 36:05 David Hoilett fouled by Ciaran Clark, the ref awards a free kick. Morten Gamst Pedersen has an effort direct from the free kick, save by Brad Friedel. 36:05 Ciaran Clark gives away a free kick for an unfair challenge on David Hoilett. Morten Gamst Pedersen takes the direct free kick. 34:15 The ball is swung over by Nathan Baker. 34:15 GOAL - Robert Pires:Aston Villa 2 - 1 Blackburn Robert Pires scores a goal from inside the area to the top left corner of the goal. Aston Villa 2-1 Blackburn. 32:15 Effort from outside the penalty area by Barry Bannan goes wide left of the target. 30:27 Unfair challenge on Gabriel Agbonlahor by Michel Salgado results in a free kick. Direct free kick taken by Gabriel Agbonlahor. 27:02 Emile Heskey challenges Martin Olsson unfairly and gives away a free kick. Paul Robinson takes the direct free kick. 24:55 The official flags David Hoilett offside. Carlos Cuellar restarts play with the free kick. 24:05 Barry Bannan takes a shot from 35 yards clearing the target. 20:09 David Hoilett concedes a free kick for a foul on Ciaran Clark. Free kick taken by Barry Bannan. 19:38 Inswinging corner taken by Robert Pires from the left by-line. 19:23 The ball is swung over by Kyle Walker. 18:42 Foul by Morten Gamst Pedersen on Nathan Delfouneso, free kick awarded. Direct free kick taken by Robert Pires. 17:30 Assist by Michel Salgado. 17:30 GOAL - Nikola Kalinic:Aston Villa 1 - 1 Blackburn A goal is scored by Nikola Kalinic from inside the penalty box low into the middle of the goal. Aston Villa 1-1 Blackburn. 15:33 David Hoilett takes a shot. Brad Friedel makes a save. 13:43 The ball is crossed by Gabriel Agbonlahor, Nathan Delfouneso produces a left-footed shot from inside the area that goes over the bar. 12:30 Martin Olsson concedes a free kick for a foul on Kyle Walker. Free kick taken by Brad Friedel. 10:46 Inswinging corner taken by Barry Bannan, assist by Barry Bannan. 10:46 GOAL - Ciaran Clark:Aston Villa 1 - 0 Blackburn Ciaran Clark finds the back of the net with a headed goal from close in. Aston Villa 1-0 Blackburn. 9:56 Inswinging corner taken from the left by-line by Robert Pires, Ciaran Clark takes a shot. Blocked by Michel Salgado. 9:56 Substitution Nikola Kalinic joins the action as a substitute, replacing Roque Santa Cruz. 7:55 Free kick awarded for a foul by David Hoilett on Robert Pires. Nigel Reo-Coker restarts play with the free kick. 7:07 Emile Heskey delivers the ball. 6:16 Effort on goal by Michel Salgado from deep inside the penalty area misses to the right of the target. 6:08 The ball is swung over by Michel Salgado, Kyle Walker makes a clearance. 4:18 Corner taken by Barry Bannan. 4:06 Emile Heskey takes a shot. Blocked by Grant Hanley. 2:33 David Hoilett gives away a free kick for an unfair challenge on Nigel Reo-Coker. Ciaran Clark restarts play with the free kick. 0:42 Effort from outside the box by Barry Bannan goes wide right of the target. 0:37 The ball is crossed by Kyle Walker.